As per studies, on an average, every smartphone user accesses YouTube at least once in a day. It has become a part of our lives. 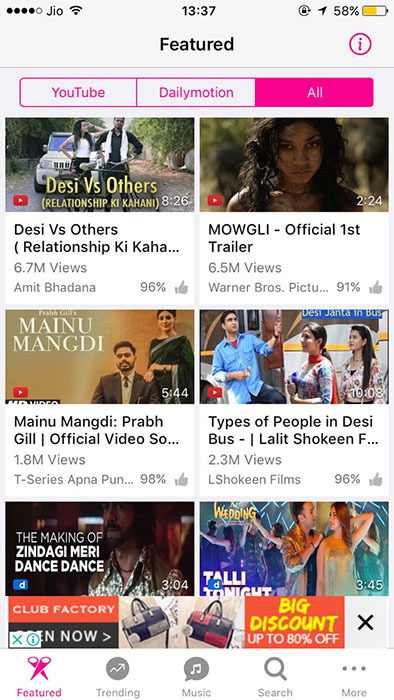 And while most of us really cherish watching our favorite videos on the YouTube app, there are some instances wherein some unwanted advertisements crop up or the YouTube app develops some lags, diluting the experience. With the increasing ads and performance lags, there came a need to look out for an alternative to the legacy YouTube app on the iOS platform. MxVideo Player is certainly a great freeware available in the Apple app store. The app is well designed and supports all devices using iOS 7 and above. It has a simple user interface and the navigation panel is quite neat. The app offers most of the key features from YouTube. You can also sign-in to YouTube from MxTube and watch and subscribe to your favorite channels. 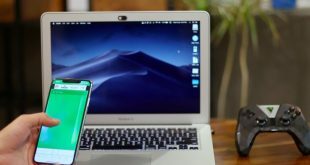 The best part is that you can also access Vimeo, YouTube, Dailymotion, and one can also access videos from other services by simply copy-pasting the URL. Make an advanced search for videos and channels and more. 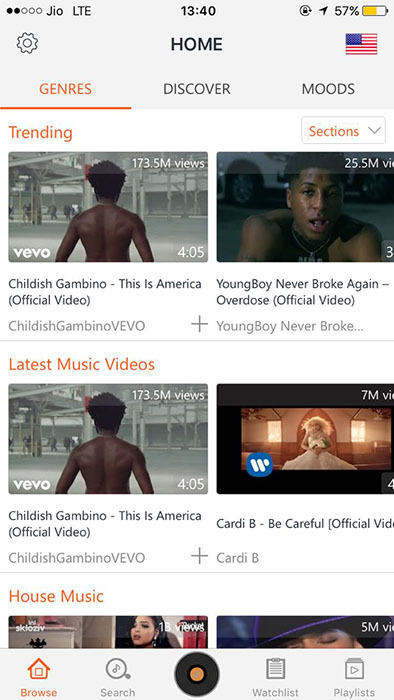 Saving views in iOS 7 and other may be a bit of a problem. Video Tube free is another high-quality app that allows users to stream YouTube videos. It is specifically optimized for iPhones and iPads providing the most of YouTube features for a seamless experience. You can operate it with a simple widget that opens from the notification center. The search functionality is great and the app is available for free to download from the app store. One can access videos from YouTube, Dailymotion, and other video streaming services as well. 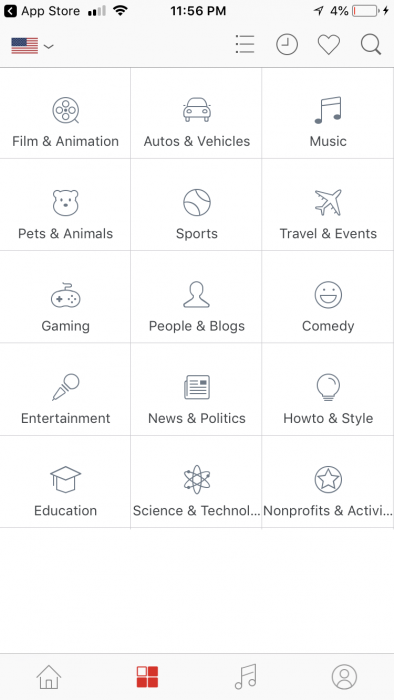 I liked the quality of the content curation and the trending section across different categories. Maintain a history of watched videos; and much more. Lacks support for some codecs when it comes to local files. This freeware is another useful app for the task. 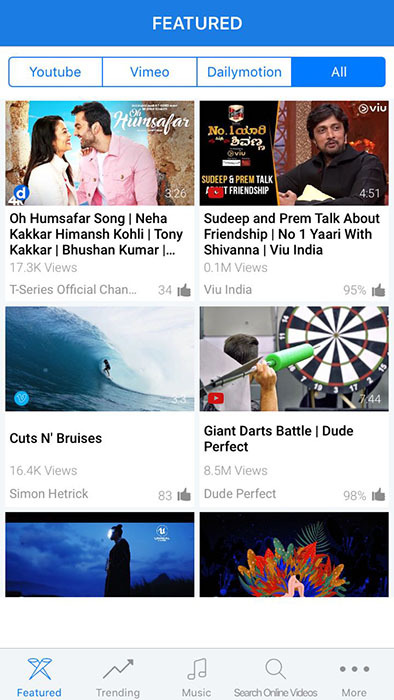 VidMate for YouTube offers a crisp user interface covering most of the features from YouTube. 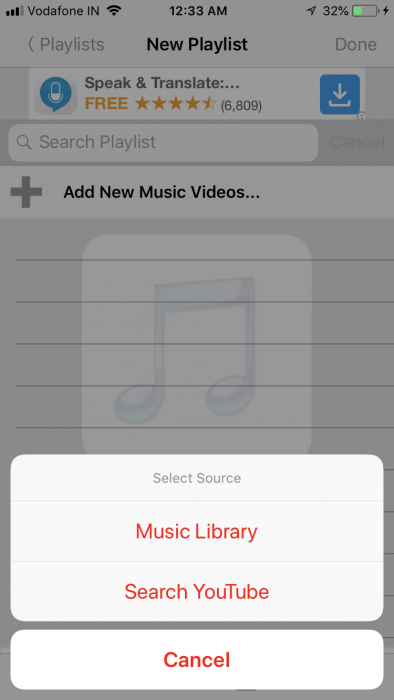 The app also comes with an option that lets you stream only the audio from a video file. 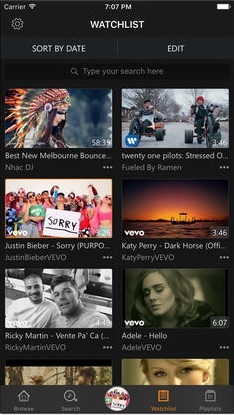 All said and done VidMate is mostly for music video lovers and the app curates the content in an understandable manner. The floating video window is a nice touch it works somewhat similar to the Picture in Picture mode. Some of its features are complicated and need improvement. Offers a great overall user experience. Allows users to choose the video quality, rate & comment on videos, and save your own folders, create a playlist, etc. Some of its features need improvement to enhance user experience. This app has a classy blend of the native YouTube app and the iOS layout. You might take up a while to get accustomed to its layout, but once you have worked your way around it, you’ll be pleased to find a lot of goodness packed in. To be frank all of these apps remind me to what extent YouTube lacks when it comes to content curation and content discovery. It is super easy to set up a playlist and also arranges the videos according to your priority. That being said I had a hard time using the app since most of the videos redirect to Vevo, a video service that is not accessible in select regions like India. 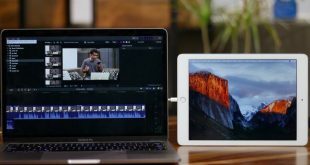 The app has quite a handful of productive features such as swipe gestures to control the volume and playback options that include going back or jumping forward for 10 seconds. The app also allows you to choose your default region and provides background audio capabilities. A complicated UI and UX which makes it a less preferred app. 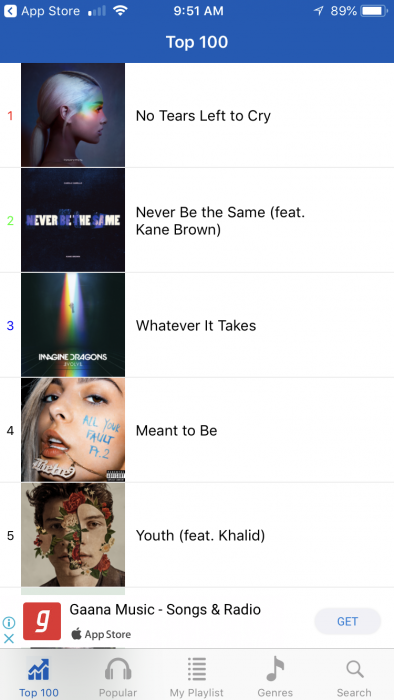 The NetTube app may not be one of the most beautifully laid-out apps, but it offers its users to seamlessly perform rapid searches on both YouTube and SoundCloud. 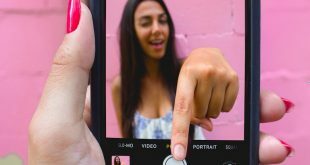 The app is more focused on Music, so if you are typically looking for an alternative to YouTube for playing music videos, this is your go-to app. I love how the app categorizes songs based on the mood and the best part is that it plays Vevo videos even in non-supported regions! If you are on a lookout for new tracks the Discover section will come in handy. Another cool thing about NetTube is that you can use this app to watch age restricted YouTube videos without signing In. Useful for individuals who like to doze off while listening to their favorite tracks. One needs to get into the nitty-gritty of the app to understand even the basic features. AudioViz is another app for music lovers and probably the best one for playing music videos. This app has a powerful audio rendering. The app’s interface is highly responsive and you can find everything you need under a single window. This is probably the only app that screens out the music from your library and suggests a corresponding YouTube video for them. Users can also manage and edit playlists that spread across different genres and categories. My favorite is the the auto playlist creation feature. With this, the app will ask for your favorate artist and then automatically create a playlist of their best songs till date. The app makes it very easy for the users to find their kind of music and watch it on the go. The app’s user interface is brilliantly well-designed and very user-friendly. Not only does it suggest the original tracks, it also shows you the different versions and remixes for the same tracks. There’s practically nothing negative about the app. 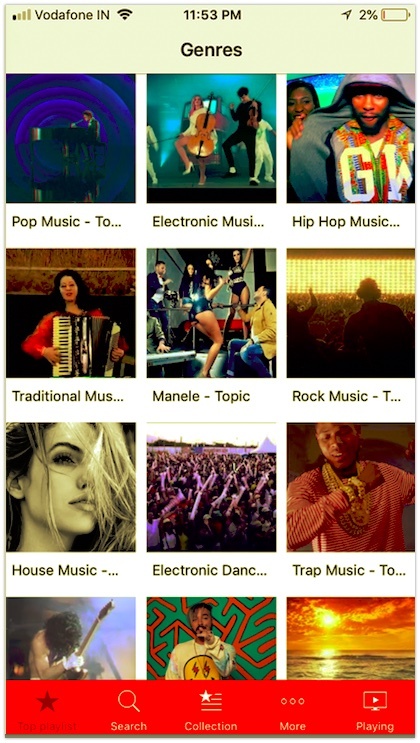 TubeX is one the most popular YouTube alternative app for iPhone. Unlike other apps in the list, TubeX comes with a material and sleak interface. The app provides you an option to login to your YouTube account, however, if you don’t want to that, you can still create playlists without signing in. It also support video history option. Overall, the app is great, there are no ads and offers great resolution. While the list of similar apps is huge, these are the top 7 alternatives for YouTube on your iOS device. If you are looking for something more specific and want to explore further, try a simple search on the App store with the relevant keywords that suit your requirement.